bothe server and LAN they have internt access without problems , but NAT is not working. please what I can do? If you went over the troubleshooting doc then you would know what your problem is.. Sniff as you send traffic - its in the doc. Does pfsense see the inbound traffic on its wan? Does it send it on? Common problem is firewall on host your trying to forward to, or it using a different gateway then pfsense - if traffic doesn't get back to pfsense never going to work. Other common problem is traffic never even gets to pfsense to forward. How is it that your downstream clients would have internet via pfsense if your downstream switch didn't have default route pointing to pfsense? Lets say client sent ping to 8.8.8.8 to its gateway on the switch at say 10.50.50.1, if switch didn't have default route how would of it sent that traffic to pfsense for those clients to have internet? 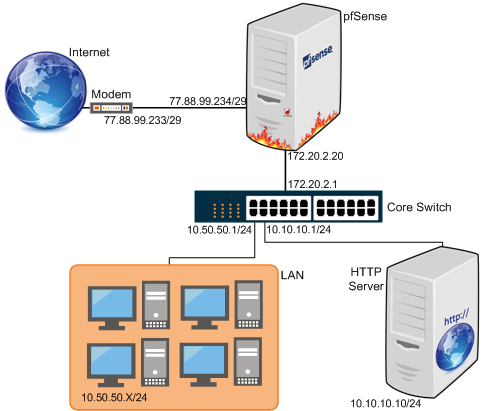 So when you say your client and server had internet - how was that working without switch having route? Where they set to use a proxy on pfsense at 172.20.2.20? So the switch knew how to get there?